It’s easy to say you trust someone with your life, harder to put the lives of your family in their hands, too. Michelle Monje, associate professor of neurology at Stanford University, has enough faith in Lydia Tam to handle both. Tam joined Monje’s lab in 2015 to conduct research and has stayed on as a research assistant. During her time in the lab, Tam contributed substantial findings, earning Tam her second authorship on a manuscript published by the scientific journal Nature. 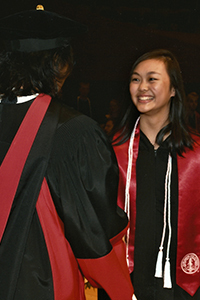 Tam used her research in an honors thesis, which awarded her the prestigious Firestone and Hoefer awards for excellence at Stanford. Tam’s list of accomplishments goes on. She received the Most Valuable Student scholarship in 2013 toward receiving her bachelor of science with honors in biology from Stanford University. She will continue her medical school education at Stanford, specializing in pediatric neuro-oncology, a field she was exposed to when she was just 15 years old. Not only did these physicians help save her life, they inspired the path she would follow for the rest of it. Her empathy stems from her life experiences. As someone who is fluent in Mandarin and Cantonese, Tam translated those skills into the medical field as the interpreter at Pacific Free Clinic, a medical clinic that serves low-income and uninsured residents in San Jose and the greater Bay Area. During her four years at the clinic, Tam aimed to bridge the language and cultural gaps between patients and doctors. In doing so, she learned the importance of building a camaraderie in patients to assuage their fears, “advocate for the vulnerable and connect patients to their physicians by eliminating any pre-existing barriers.” As a cancer survivor, she was able to offer firsthand experiences to patients who were experiencing the same journey. She also spent time volunteering in East Palo Alto to help students from low-income families with their math and reading. Even as a tutor, the future doctor in Tam prevailed. In addition to helping them with their studies, Tam encouraged students to adopt a healthy lifestyle and better eating habits. She hopes to mobilize her peers to serve their local communities through her medical school career. Now, Tam will go on to represent the Elks as she continues her medical school education. 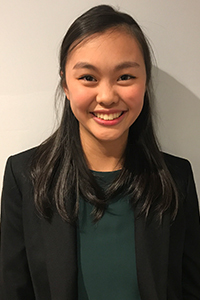 She feels privileged to have the opportunity to study medicine and, like her fellow Elks scholars, wants to use it to be a positive influence in the world. After losing her husband, Gunther, to a staph infection in November 2009, the late Lee Weigel wanted to improve the quality of healthcare in our country. To realize that goal, she partnered with the Elks National Foundation to endow the Gunther and Lee Weigel Medical School Scholarship, which helps Elks scholars pursue careers in medicine.